Solar Saddle Manufacturer - SOLAR SADDLE SINGLES - PARTS - Solar-EZ, Inc. Solar Saddle - Manufacturer's Information Website, by Solar-EZ, Inc.
Save Time, Effort and Money, stop wrestling your solar cover use the one step Solar Saddle system. Solar Saddle - A Very EZ, Safe and Convenient one-step Solar Cover Storage System. DON'T TEAR YOUR TOP RAIL OFF USING A CHEAP IMITATION CHINA MADE METAL KNOCK OFF PRODUCT! FOR 26 YEARS SOLAR-EZ, INC. HAS SPECIALIZED MANUFACTURING FLEXIBLE, DURABLE, J POLYMER SOLAR SADDLE COVER HOLDERS. WE WILL CONTINUE TO PROTECT CUSTOMERS SAFETY BY USING ONLY FLEXIBLE, NON-CORROSIVE, NON-MARRING, POLYMER MATERIALS. Click Here> Additional Single Solar Saddle Kits and parts are always available for special needs. One-Step, One Person, out of the way Solar Cover Storage! Always choose Solar Saddle® over a solar cover reel. Your solar cover storage needs are solved. Click the "RED ICONS" below and left, let "Solar Saddle®" make your life easier! Below shows Solar Saddle® easily storing a 27 foot round pool solar cover. "PROUDLY MADE IN MICHIGAN, USA"
For Safe, extremely Durable, EZ, One-Step, Solar Cover Storage System! ARTIFICIAL INTELLIGENCE IS NOT NEEDED TO THINK ABOUT THIS! THE EXTREME MAGNIFIED LEVERAGE PROVIDED IS UNSAFE AND WILL DAMAGE YOUR POOL. AND WITH ITS INHERENT STRENGTH ACTS AS AN UNFORGIVING STEP LADDER FOR YOUR KIDS TO CLIMB AND PLAY ON! Polymer Shear Pins are used to enhance your safety and to provide easy Solar Saddle® removal. Polymer Mounting brackets can be trimmed and are designed to flex for your pools safety and are very strong for secure durable mounting of solar saddles©, yet will give way for protection of person and pool. Space age Polymer materials, using proprietary formula, is used for extreme strength and designed flexible qualities to prevent damage to swimming pool and you: Saddles contain no metal. Flexible Strong Polymer Solar Saddle® are easily removable by pulling one polymer pin. Additional parts and, single saddle assemblies, are available to fill you personal needs. Priced to provide your needs. 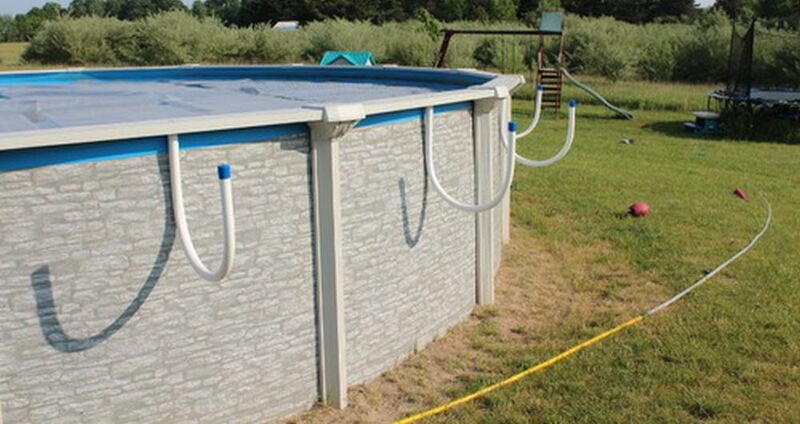 a) Open pipe frames, use electrical ties, or 1 1/2" stainless screws on Intex type pools; trim sharp corners as needed. If you vary from our directions use the brackets with shorter screws and trim sharp bracket corners round. b) Waffle built plastic top rails, slightly trim bracket to mount between vinyl waffles. and it cost much less than a solar cover reel. Click the "RED ICONS" ABOVE and left, let "Solar Saddle®" make your life easier! In one step, your solar cover is removed and neaty stored. Solar Saddle ® connects to your pool on any side. Your solar cover can be placed back on your pool surface while you are either in or out of your pool. Our customers tell us that their Solar Saddle ® is easier to use, much quicker, and cost less than an above ground solar cover reel, many have replaced their solar cover reel with the Solar Saddle ®. It does not require the strength, time, or the inconvenience of manhandling and storing issues that an above ground solar cover reel requires, and it cost much less. Many customers say they replaced their solar cover reel with our product. Quote, "We installed your product and hung the solar cover reel on the back fence." "Where do you hide that big ugly solar cover reel?" You put your solar cover in your Solar Saddle ® cover holder and your job is, DONE! "An anti-pool husband commented on how easy it was to cover and uncover the pool." "The saddles will attach on a Watson and other pools with the waffle top rail." "The product is stronger then I thought it would be." "We installed it on the long side of an 18 X 34 pool." "I suffer from disc disease in my back and it was not a problem going on or off!" Start here for special parts needs. For special parts needs, E-mail Solar-EZ,Inc. Hangers, and complete Single Saddle Kits. I bought this to store our solar cover. Easy to install using a drill and 1 1/2 screws. Some reviews say it does not work on the intex pools but it works great. I am pleased with my purchase and recommend it to keep your cover clean off the ground. I was very hesitant to buy these for my pool because no where did it say or show different ways to attach it. Basically if you have a area to screw it to onto the pool frame (using a 1 1/2 inch screw) it will work on any pool. Easy to install. The product is stronger then I thought it would be. We installed it on the long side of an 18 X 34 pool. We used the 5 saddles and they hold the solar cover just fine off the ground. Rating 5 of 5 stars. the manufactures, solarsaddle.net, website and found that if you trim a small amount of the bracket it will fit between the waffles just great, and it did. I talked with the customer service and they said that was fine to do since lots do it. Many reviews said it is flimsy it is not it is safe to use and the materials are very tough. Every summer since we have had a pool the solar blanket was always wadded up on the deck and was such a pain to put on and take off. It was usually never put on and there for the water was usually cold. I have to say that even my anti-pool husband commented on how easy it was to cover and uncover the pool. Our pool is 24' round and I have a 27' cover to go over the sides. I can now do it by myself in a matter of minutes. I suffer from disc disease in my back and it was not a problem going on or off! Well worth the money!!!! So easy to use and very convenient. We hung it on the backside of the pool and it is completely out of the way with or without the solar cover. Great invention! It takes seconds for one person to cover/uncover the pool and you don't notice it hanging on the back-side. and shear pins, Please think about it!! You or your insurance will not want to cover the cost of damage caused by it caving in or scrapping the sidewall and/or ripping off the top rail. Safety features must be included on all mounted products such as flexible mounting brackets and shear pins as mentioned above. Safety First always! Solar cover reels may be harmful to your health. E-Commerce, Retailers, and Wholesalers inquiries are welcomed! SOLAR SADDLE ® BY SOLAR-EZ, INC. Replace your above ground solar cover reel with a, "Solar Saddle®, and your family will make you glad you did! Solar cover reel use may be harmful to your free time. Please, you dealers not listed, Let us know you want to be included on this Solar Saddle solar cover holder dealer list. No part of this material may be reproduced in any form or incorporated in any information retrieval system without written permission of the Publisher. "Copyright 2000 - 2019, All rights Reserved. Solar Saddle®, Solar Cover Holder ™, - Swimming Pool Solar Covers"